Again I am embarrassingly late to embrace a trend. 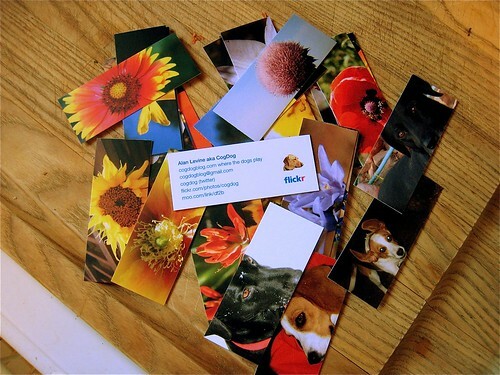 Moo cards have been around like since Web 1.6 – those slick half sized business cards that feature a different image on each card, and quite often images personally picked from flickr. The Moo tools are as easy as dipping Oreos- you give your flick credentials and you can then start selecting images from your photos, from your tags, sets, or just poking around. I rummaged around my hundreds of my photos flowers and dogs. You don’t have to select 100 pictures to make 100 cards (if you use less you get repeats). You can customize the info that appears on the back, including your flickr icon (yay) and either free text on the six lines of print, but can also have information auto inserted based on the image used (mine has a URL to the photo). But what I liked most was the whole moo-ing experience. It was fun, and my interactions with the site and service came across like it had a personality. I mean, they have made something as drab and ordinary as ordering business cards exciting. Imagine if someone could do that with say, tax returns or plumbing repair. Maybe. It starts right away from the moo site very prominent is “we like to print” – is that a human mission statement or what? And “We are a printing company where every one is different” – look at the layers and nuances of meaning here. I’m Little MOO – the bit of software that will be managing your order with us. I will shortly be sent to Big MOO, our print machine who will print it for you in the next few days. I’ll let you know when it’s done and on its way to you. I love Little Moo. I smile. And how can one really comprehend the sensation of having such individualized cards? Not with a monotonous repeating graphic, but each one different, each one something I “made”. Perhaps to you, my quiet blog reader, this seems so obviously apparent. But how often do we have a rewarding, an energizing experience with a company? How often does it feel more like you are dealing with a person or a faceless entity? Moo has the personality part nailed, and I may not even care if it is contrived. If anyone wants this experienc, email me directly or direct message me on twitter- I have one of those discount codes for 20% off your first card order. And you may Love Moo Too. 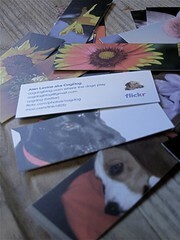 I have never ordered, but have admired moo cards from sometime. 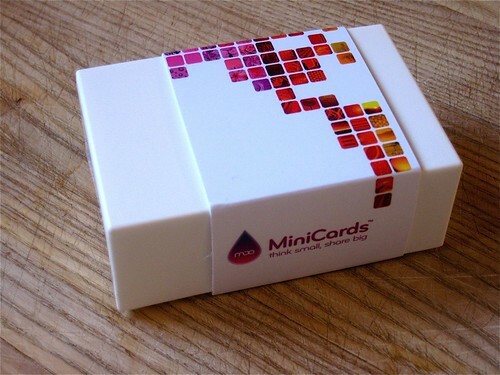 There is a group on flickr devoted to figuring out the best containers to hold these cards! It was fun to read. I teach an intro to multimedia class. We do quite a bit with photoshop and I was seriously thinking about have a moo card assignment. 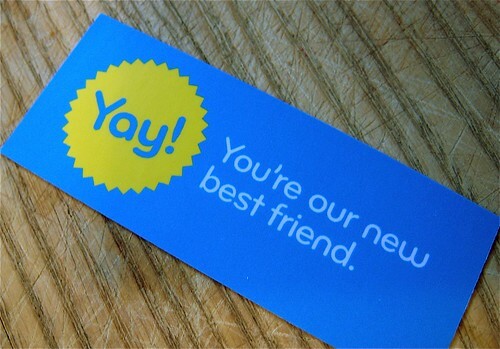 I am also interested in having them design social networking cards (the skinny size looks a lot like a moo card). In our area, Walgreens is pretty inexpensive and does nice prints from uploaded photos. But you still have to get at least 4 of a kind if you order wallets. . .
You are right! It is fun! I LOVE THESE. I think they rock. *If* they had been around when I was teaching, I would have totally created a class set. At the time, we had a class blog (on blogger – I think this was pre-edublogs, et al.) and a space on flickr (to share projects – we would photograph the project and students would enter their assignment, description, etc). This was intended as a community outreach effort (ie, to keep busy parents in touch with what was going on in the classroom, in a way that was text-based and visual — literacy levels varied widely in the community). The fact that you can customise all 100 cards, if you so wish, means that each student could choose a representative photo (or have 3 or 4 copies of the same, if it were a class of 30 ish. 1 to keep, rest to distribute). Pass them out at parent teacher night, to other teachers, to community members, whoever you want to see your ‘goods’. I love the moo crowd too and the customer service I’ve always received. I was in London a week or so back when they had their street party to which all customers were invited for a drink and to be handed their latest order (handed!) by the moo postman. Didn’t get there but can you imagine any other business card business doing such a radical (aka fun) thing.